Small Tile Top Kitchen Island with two (2) 24" comfort bar stools. 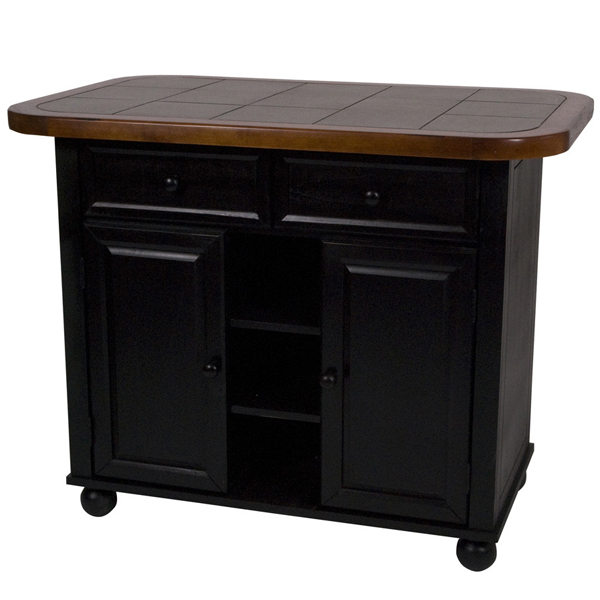 Hand crafted solid wood kitchen island with a tile top for easy maintenance. Ceramic tile top for easy maintenance. Two (2) spacious drawers for dining linens and utensils. Two (2) doors underneath open to one adjustable shelf for convenient access and storage of cookware and other large kitchen/entertaining items. Three (3) open fixed shelves for prominent display of decorative mixing bowls, baskets or gourmet cookware. Four (4) bun feet at bottom of base. Adequate storage space. Asian Ramon Hardwood. 1 year warranty against manufacturer defects. Adjustable sliding ceramic counter top with 3 locking positions.